The British music scene thrives on a surplus of festivals all year long of every scale and size. The rising demand for cities to create new events opens the marketplace up in a positive way. The expansion of festivals allows for a diversity of music and artists to share their sound on new stages. That special time of year when summer festivals start revealing their lineups is right around the corner, an early bird being Found Festival. Found Festival holds a unique roaster of British DJs and draws upon global support.Kerri Chandler is the main headliner, an American DJ from New Jersey, who has performed on BBC Radio 1 and hosts a feature, Kaoz Theory. Chandler grew up playing garage and disco since age thirteen as a DJ and has since built his own studio and DJ equipment. Another impressive name on the lineup is British born producer Midland, an inspiring and energetic act to hear live. Berlin musician Rødhåd will also make an appearance with his darker and deeper style. On the funkier side of things is Theo Parrish, a Swiss DJ who knows how to make crowds move. Take a look at the entire lineup below. Found Festival takes place on June 11th and runs from 11am to 9pm. 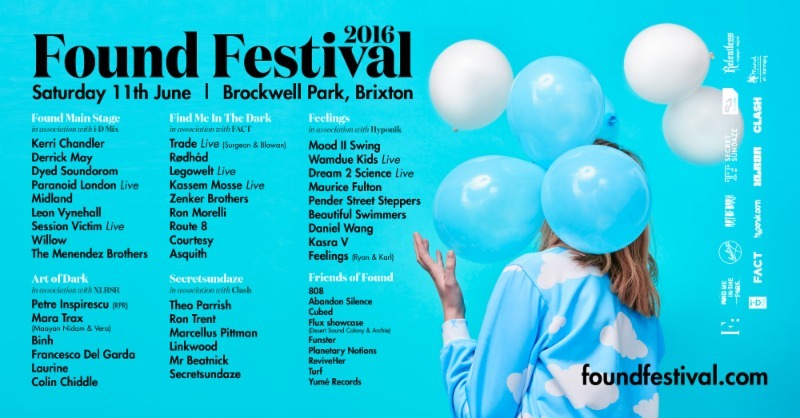 There are six stages strewn across Brockwell Park for the festival's fourth consecutive year. The artist curation and booking is done by Found Series, a British based event organizer. The first wave of tickets are going for 22£ if you're interested in hearing a grand group of DJs and performers alike! Dance · Dancehall · Deep House · Festival · Techno · U.K.